My Chicken Bacon Ranch Biscuit Casserole combines all my favorite food groups into one comfort food casserole. 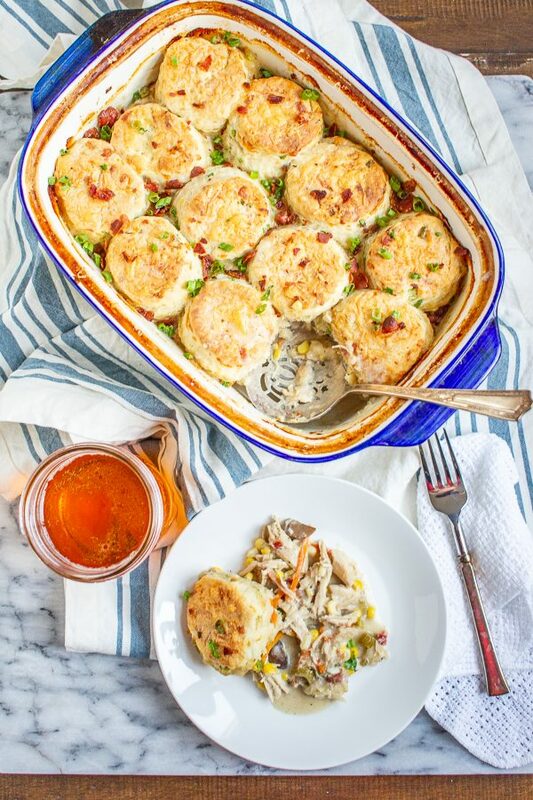 This Chicken Bacon Ranch Biscuit Casserole is similar to a chicken pot pie, but of course instead of a pastry topping, I added homemade cheddar and green onion biscuits on top of the chicken filling. 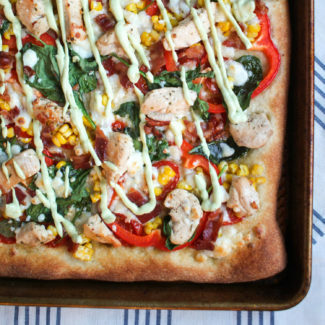 The chicken filling is made with shredded chicken, bacon, mushrooms, celery, corn, onion, and corn in a creamy ranch sauce. 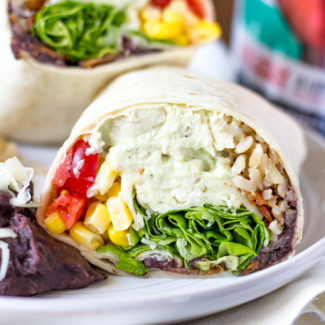 The sauce has a hint of ranch, but you could add more ranch seasoning to taste if you like. I wanted it to be subtle as to not overwhelm the flavors of the vegetables. When I want to get ahead of the dinnertime game going into the week I buy two rotisserie chickens and shred up all of the meat. I can use the meat to make at least two different meals during the week and I have just cut down on the preparation time. 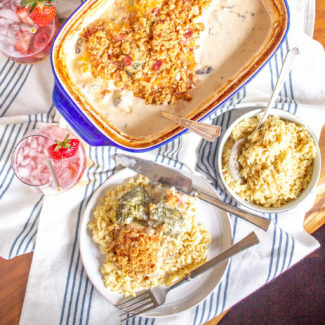 This recipe was inspired by shredded chicken that I had waiting for me in the fridge. The process of making this meal is easy. First crisp up the bacon, and crumble it. While the bacon cooks, you want to prepare the biscuit dough. It needs to rest for 30 minutes, so mix it up first. 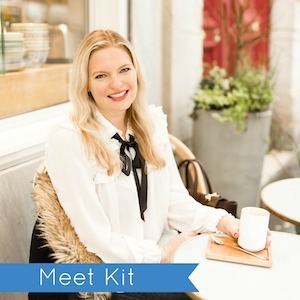 It’s easy and will take you less than 10 minutes. Prepare the filling as the biscuit dough rests. 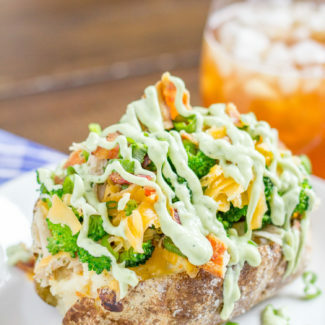 You start by chopping and sautéing the vegetables, and then you prepare the creamy ranch sauce and add all of the veggies, the bacon, and the shredded chicken. Let that simmer on low while you preheat the oven and cut out the biscuits. 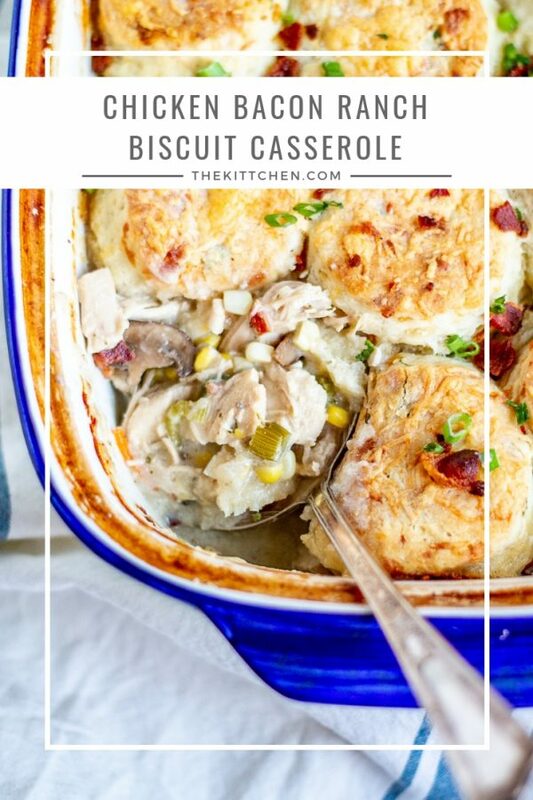 The hot chicken filling goes into a casserole dish and then you arrange the biscuits on top. The bake time is only about 20 minutes. 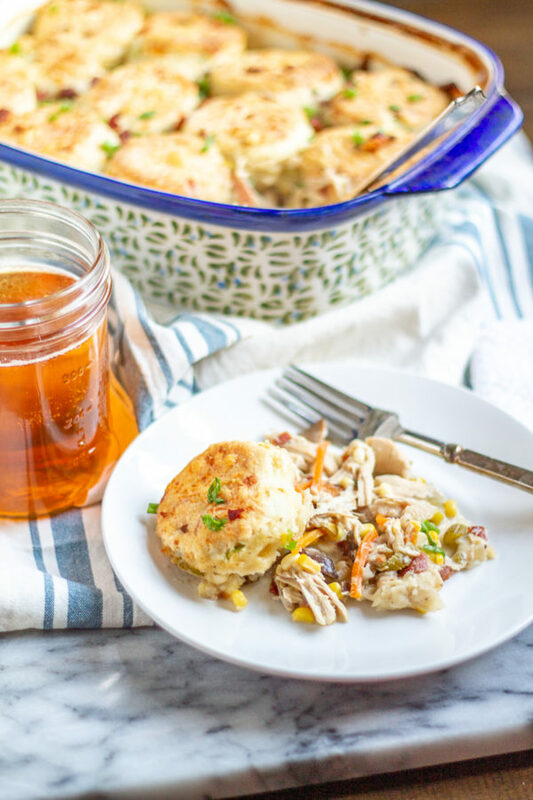 The chicken filling is already cooked and hot, so you just need the biscuits to cook. 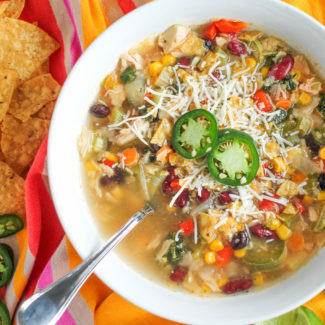 The active preparation time for this meal is only about 45 minutes. 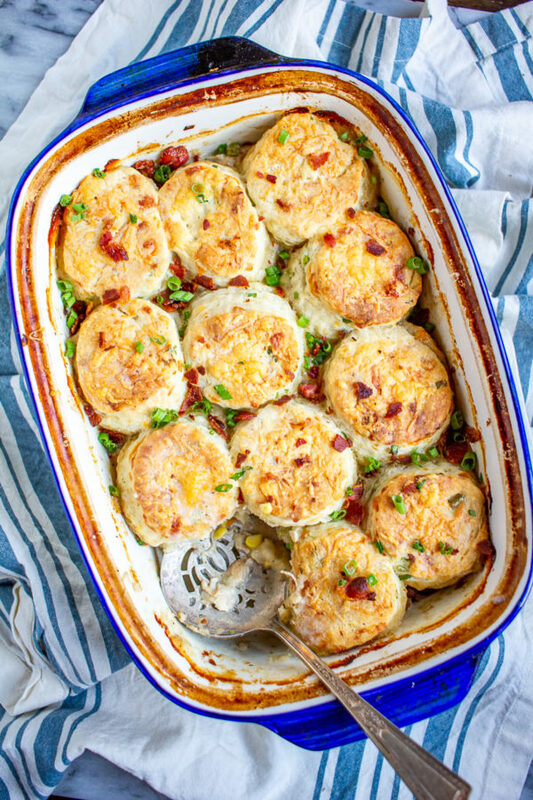 Chicken Bacon Ranch Biscuit Casserole combines all my favorite food groups into one comfort food casserole. 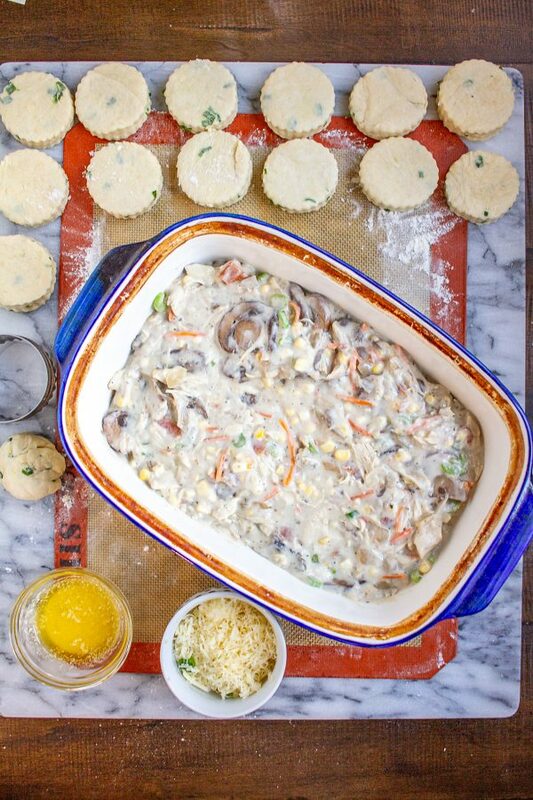 The chicken filling is made with shredded chicken, bacon, mushrooms, celery, corn, onion, and corn in a creamy ranch sauce. Heat your oven to 425 degrees. Spread the bacon out on a foil lined baking sheet. Bake for about 10 minutes, until crispy. Blot the excess grease with a paper towel. Set aside. 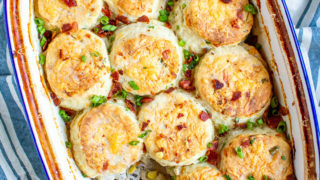 Mix up the dough for the cheddar and green onion biscuits, and then work on the chicken casserole filling while the dough is resting. Melt 1 tablespoon of butter in a large pot over medium heat. Add the onion and sauté until translucent. Then add the mushrooms and season with salt and pepper. Sauté for another 6 minutes, until lightly browned. Remove the onion and mushroom from the pot and set them aside. Using the same pot, melt 1 tablespoon butter over medium heat. Once melted, whisk in the flour, continue whisking, letting the flour cook for 1 minute. Then whisk in the chicken broth and then the cream of mushroom soup, sour cream, and ranch seasoning. Bring to a slow and steady bubble and let the mixture thicken for 1-2 minutes. Add the onions, mushrooms, carrot, corn and chicken. Crumble 4 of the slices of bacon and stir it in. Bring to a simmer and let simmer for 1 minute. Pour the chicken filling into an ungreased ceramic casserole dish. Then arrange the cut out biscuits on top. 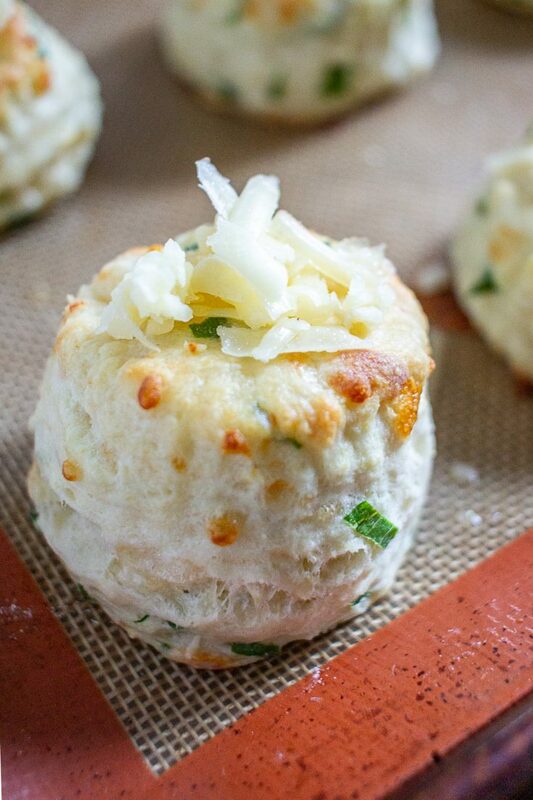 Brush the top of the biscuits with 1 tablespoon melted butter, and sprinkle with 1/3 cup shredded cheddar cheese. 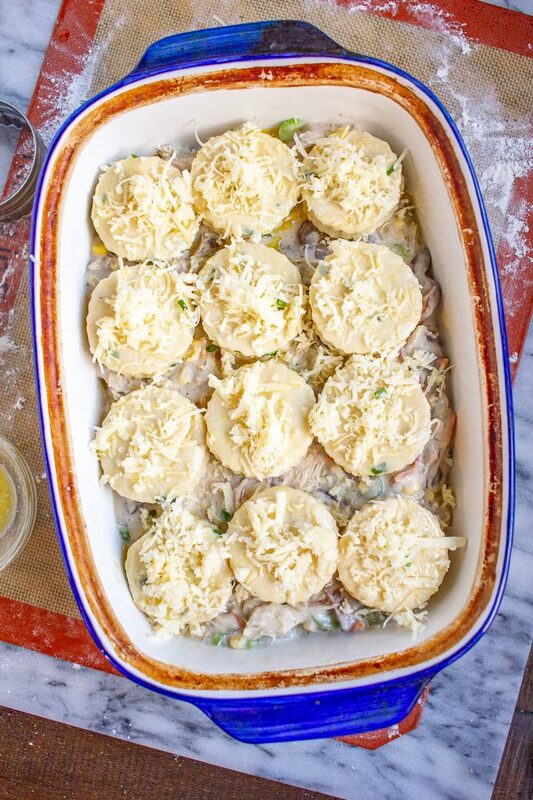 Let the casserole bake at 425 degrees for 14-18 minutes, until the tops of the biscuits are golden brown. 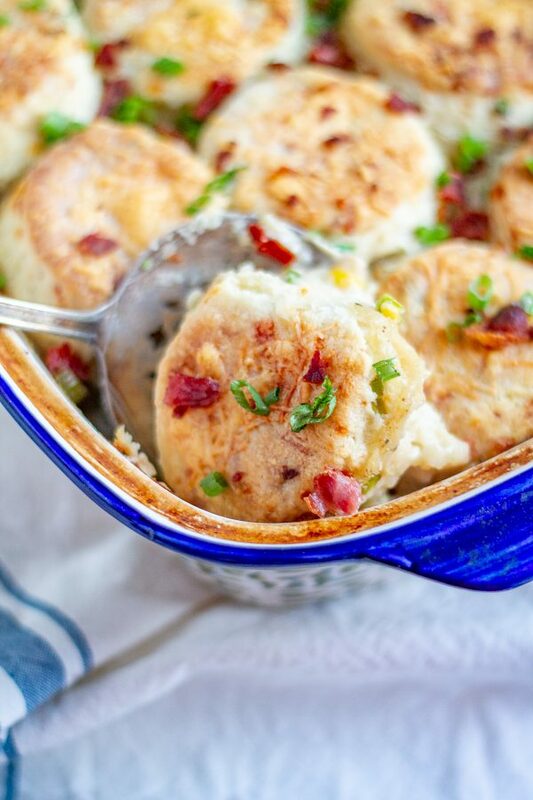 Crumble the remaining slice of bacon and use it to garnish the casserole, along with some sliced green onion. 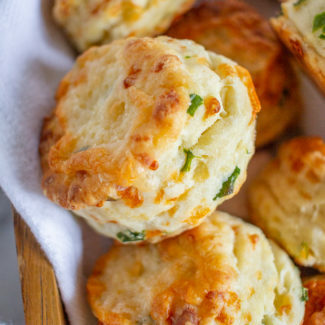 Green Onion and Cheddar Biscuits are easy to make with just 20 minutes of active preparation time. 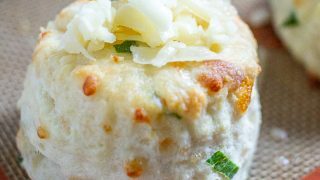 These biscuits are the ideal combination of buttery and cheesy, with a nice fresh flavor from the green onion. In large bowl, whisk the flour, sugar, baking powder, and salt together. Then add the butter and mix with your hands until the mixture resembles cornmeal. You can pulse the mixture together with a food processor if you prefer. Add 1 cup of the cheese and all of the green onion. Gently stir in the buttermilk, and the milk starting by adding 1/4 cup and adding more as necessary. You want the dough to be sticky, but not overly wet. I found that adding 1/3 cup of milk was just right, but you might need slightly more or less. After 30 minutes, move an oven rack so it is at the level where it is on the top third of your oven. Heat your oven to 425 degrees. Pour the dough onto a floured surface and roll it out until it is about 1/2 inch thick. Fold the dough up into thirds and roll it out again. Repeat this two more times, this gives the biscuits flaky layers. Use a biscuit cutter to divide the dough into about 12 biscuits. Or just a knife to cut the biscuits into squares. Place the biscuits on a silicone mat or parchment lined baking sheet. Do not place the biscuits in the oven until the temperature reaches 425 degrees. Place the biscuits on a rack on the top third of the oven - not just in the middle. Bake the biscuits for 12 minutes. Then remove from the oven and brush melted butter and sprinkle the remaining cheese over the top of the biscuits. Let cook for another 3 minutes, until the biscuits are just starting to brown. Then turn on the broiler for about a minute to get the cheese nice and crispy.